Kawasaki has taken the wraps off the 2009 bikes including the new ZX-6R, ER6-f and ER6-n, three new cruisers and a new KLX250 enduro-style machine. Full details are in the September 24 issue of MCN. Kawasaki has given the already brilliant faired ER6-f and naked ER6-n a complete going over to try to keep them at the top of the hard-fought middleweight class. For 2009 the ER6s will go up against favourites like the Suzuki SV650 and Bandit 650 and GSX-F650 which remain unchanged, the new Ducati Monster 696, Honda CBF600, Yamaha Fazer 600 and new Yamaha Diversion 600 revealed last week as well as the Aprilia Shiver. Both updated bikes are based on the same frame, chassis, wheels and suspension – the ER6-f faired version gets completely new bodywork and top fairing compared to the current model with Kawasaki happy to make the link to the Supersports bikes in the Kawasaki range. The naked ER6-n gets a similarly complete working over leaving the looks a little similar to the KTM 690. There's no doubting the fact the ER6-f is a great looking motorcycle. 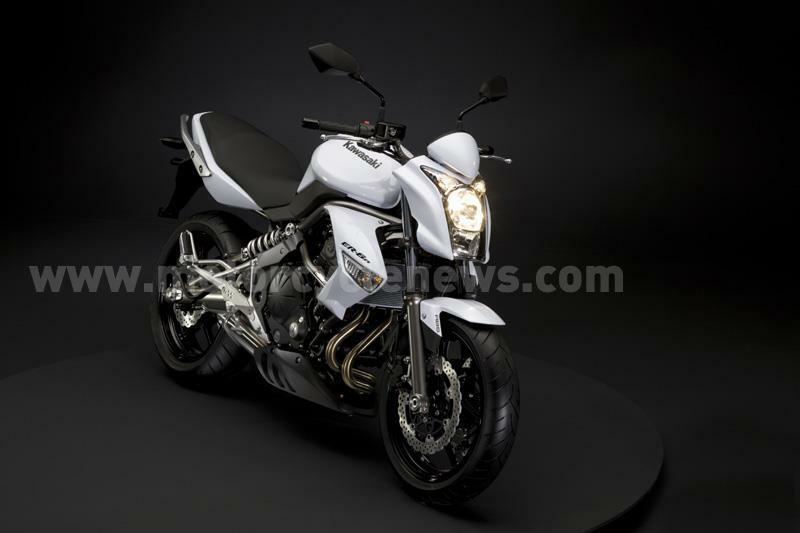 Sportier looks based on the Ninja supersports range, a new frame, swingarm and suspension are backed up by the restyled bodywork, with a new taller fuel tank adding to the fantastic 650cc parallel twin motor. Kawasaki isn’t revealing too much information about the new bikes at the moment – the full technical details will be released at the Cologne Show in early October. What we do know is mechanical changes to the engine are not radical – just as well as the 649cc parallel twin powerplant is one of the best bits of the current bike. With 71bhp, the current bike is able to provide a superb package - the decent torque of 49lb ft allowing the light weight and easy handling to deal with town and country roads easily with a 130mph top speed. It's unlikely the new engine will have much more power or torque but Kawasaki has revealed it will rev more easily - suggesting engine internals have been lightened to allow this to happen. The other changes that have been made to the motor include tweaks to fuel injection and mapping to give smoother low and mid rev range response and allow it a quicker revving character. 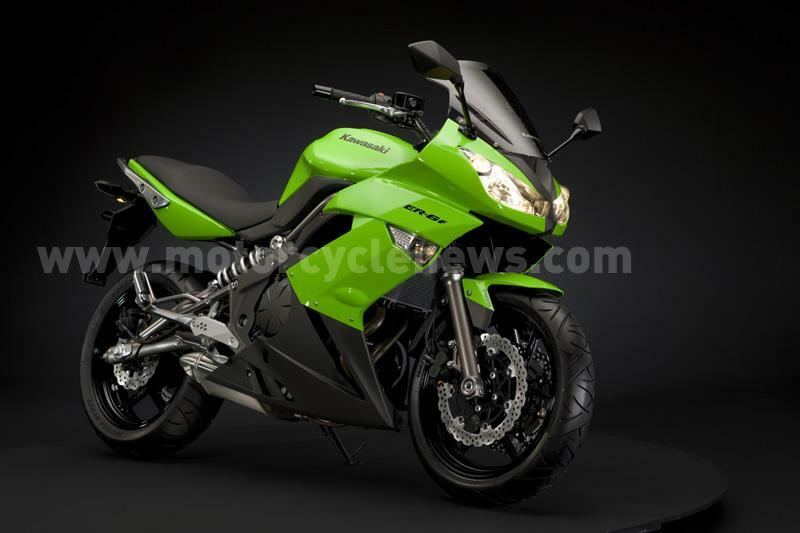 According to Kawasaki the changes to the rest of the bike are aimed at reducing vibration and giving the bike lighter handling which suggests some weight-saving has been done on the steel framed bike. The ER-6 has always been a great fun package offering an accessible bike to new riders but still able to keep more experienced people happy and entertained. Wavy discs, off-set rear suspension and an underslung exhaust all remain in place with the updated looks giving the bike a much more aggressive look. Anti-lock brakes remain an option on both versions of the bike - currently a £300 option. Kawasaki may not be revealing much detailed information about the two versions of the ER6 but the Japanese firm is making it very clear it doesn't want to alienate less experienced riders with an overly sporty machine. A Kawasaki statement about the bikes says: "Building on the key values of its highly acclaimed predecessor, the new ER-6f continues to offer a package that is both fun and easy to ride, and matches its sporty street performance with aggressive new Ninja supersport styling. "The balance of compact size and good power offered by the ER-6f’s predecessor was the key to its success. To fit into its trim package, an in-line four would have been too wide and a V-twin too long. The only engine design that offered both good power characteristics and the requisite compactness was a Parallel Twin. "While maintaining this balance, the new engine gets a number of tweaks that offer smoother low-mid response and a quicker-revving character. Changes to the frame, swinging arm and suspension result in reduced vibration and lighter handling." Prices for the new versions of the ER6 are not expected to rise much above the current levels of £4295 for the ER6-n and £4495 for the ER6-f.